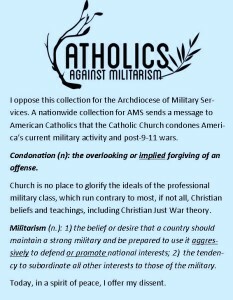 These were originally intended for the collection for AMS in November 2013 but may be useful at other times when militarism is allowed or encouraged during Mass or at your local Catholic church. 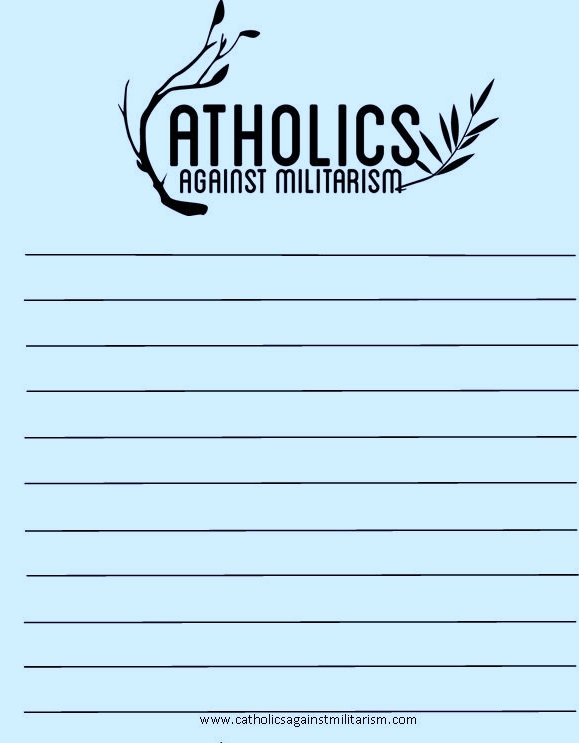 Letters, Encyclicals, Messages, Speeches, etc. 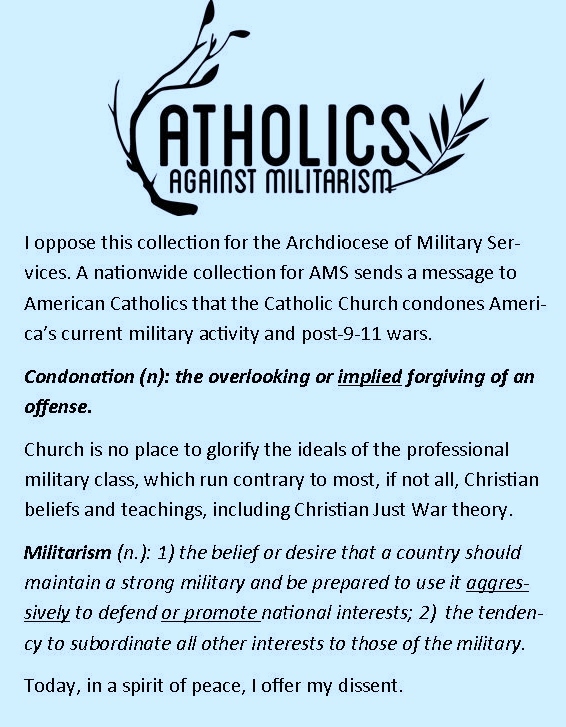 Catholicism and the Just War [Defense] Tradition: A six-part video series on YouTube, each part less than 10 minutes long, made by an educator, about Just War with some commentary and historical perspective. Well done and worth a watch! Christian Just War Theory: The Logic of Deceit, a powerful exhortation, the secondary purpose of which is “to critique the Christian Just War Theory (CJWT),” and the primary purpose of which is “to invalidate CJWT forever.” It was written by a Catholic priest of the Eastern Rite, one who could surely be described as a voice crying out in the wilderness, and is well worth the read if you have first familiarized yourself with the official teachings and with what appears in the above section of the Catechism. See Resources page at Pax Christi USA. See Resources page at Catholic Peace Fellowship. Behold the Lamb, audio/video series on Gospel Nonviolence by Emmanuel Charles McCarthy, a priest of the Eastern Rite (Byzantine) of the Catholic Church. Emmanuel Charles McCarthy was nominated for the Nobel Peace Prize for his life’s work on behalf of peace within people and among people. Joyeaux Noel (2005), On Christmas Eve during world War I, the Germans, French, and Scottish fraternize and get to know the men who live on the opposite side of a brutal war, in what became a true lesson of humanity. Father George Zabelka, The Reluctant Prophet, Biography; As a young priest and active duty officer in World War II, Father George Zabelka was the chaplain who offered spiritual reassurance to the crews of the bomber planes that dropped atomic bombs on Hiroshima and Nagasaki. The conflict grew for him between his identity as a Catholic priest and his identity as a military chaplain. Of Gods and Men (2010), Under threat by fundamentalist terrorists, a group of Trappist monks stationed with an impoverished Algerian community must decide whether to leave or stay. Sophie Scholl: The Final Days (2005): A dramatization of the final days of Sophie Scholl, a young woman and one of the most famous members of the German World War II anti-Nazi resistance movement, The White Rose. The Catholic Peace Tradition: This book is a history of the peace tradition in the Roman Catholic Church from the time of the Gospels to the twentieth century. 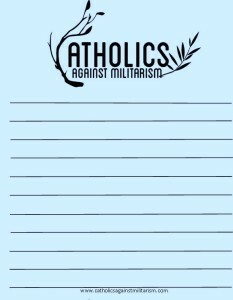 Its purpose is to show that there is a continuing, unbroken, and self-sustaining stream within Catholicism from the martyrs and pacifists of the early church to John XXIII and the peacemakers of our time. The Bronze Bow by Elizabeth George Speare; This gripping, action-packed novel tells the story of eighteen-year-old Daniel bar Jamin—a fierce, hotheaded young man bent on revenging his father’s death by forcing the Romans from his land of Israel. Daniel’s palpable hatred for Romans wanes only when he starts to hear the gentle lessons of the traveling carpenter, Jesus of Nazareth. When Rome Started Burning Music video that asks some good questions.